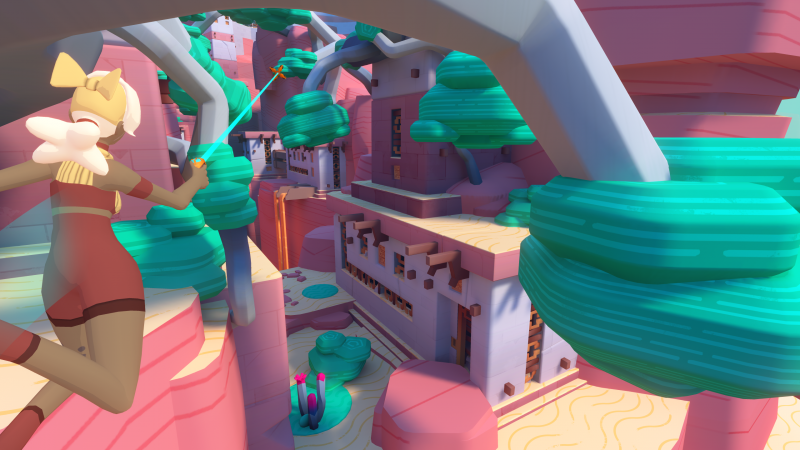 The first thing you will notice about Windlands 2 is this time they have brought with it a fully fledged story mode, which takes part of the centre stage of this instalment. In this story you are again placed into the role of a guardian, as you return to the ruins with your hooks and this time a trusty bow. The world is now under threat of the blood guardian being resurrected, the question is can you stops this? 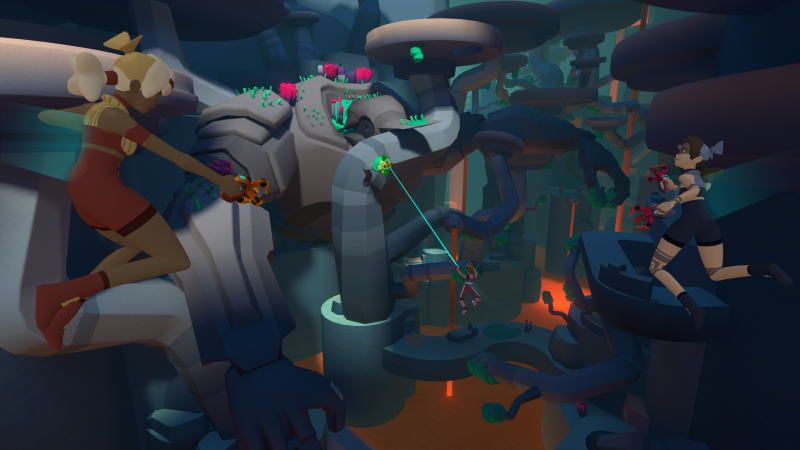 The core mechanic of the gameplay has stayed in place, and this is traversing the ruins with you use of your hooks, by grabbing onto the greenery placed around the level. This is important as a good part of these ruins are missing the floor, so this is really the only way to get around the Windlands. As you get further into the story you do need to stop relying on this hooks, as the game does throw some platforming elements that will require your jumping skills. So remember to get practice in with these where possible – as the low gravity can sometimes be tricky. Then they have made the fantastic addition of enemies, with the first being two standard enemy types. These appear in objectives and also later in the game show their faces around points while traversing the universe. Then you have these huge titan bosses to take out and these do become very intense, as you try to hit the week points while avoiding their incoming fire… or sometimes taking on the additional standard enemies between boss damage rounds. One great thing I loved about these boss battles is they all take place in a unique area, all that are going to require a different approach to take down while avoiding your own certain death. This gives each battle that feeling of being different, although the goal is ultimately the same take out the targeted weak spots. The way you are going to take these on is using the aforementioned bow that has been introduced, and it really is responsive and accurate. With you needed to judge the trajectory of the shot for enemies in the distance or that might be flying around the area. 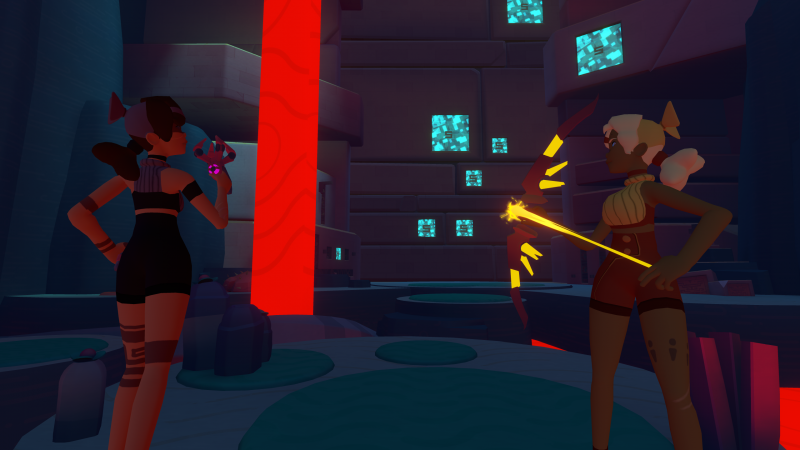 The team really have made sure the combat is smooth and accurate to eliminate and frustration in this area. However, the biggest addition for me is the four player co-op mode for the campaign, this is something that has been essential. It really is the best way to play the game, jumping in with others while moving around the Windlands and working together to take down those bosses. All while having company, but do not worry if you want to take it on a lone guardian that is included also, so you can really play the game the way you like – but, I would say give the co-op a try, as it really is a lot of fun working as a team. When it comes the to presentation style, it has kept the similar cartoon style cell-shaded look, but everything is so much more refined. With the inclusion of NPC’s appearing around the world in the campaign, you really do get a lot more visual stimulation just from that one thing alone. The environments seem a lot more populated with the increased amount of greenery that has been so instrumental in giving you that badass feeling while traversing through the settings – which is down to the level of immersion the game offers. You really do feel like a this guardian and taking in all the possible paths in this environment full of opportunities to soar, and removing some of the sparseness you felt times in the original. 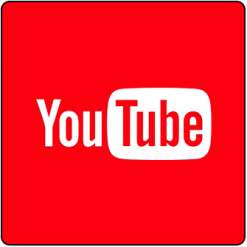 With the game bringing with it a very entertaining and fully fledged story it was important the audio was done correctly. All the voice acting is strongly done and you can see the team have really made sure they got the correct voice to match the characters design. Some of the NPC lines as you walk around had me cracking up – because of the perfect delivery of the lines. They then add to this sounds of the enemies, your hooks, your bow and the environmental sounds, and it makes sure you are kept immersed in the universe the team at Psytec Games have so lovingly put together over the game’s development. Windlands 2 can be played either standing or seated, it really is down to how you personally prefer to play the game. Where I didn’t mind playing it standing, at points of the quick movement I sometimes felt like my legs wanted to give way – so I played a good portion of seated just in case. The controls are so well mapped for the Windows Mixed Reality Motion Controllers, meaning you really can pay attention to where you are aiming to grapple onto next to keep your momentum to reach the next goal. Your main buttons are the triggers to fire the grapple in the corresponding hand. Then the grips will be your bow, with the one you press first loads up your bow, then the other is used to pull back and fire – meaning you can switch hands if you need to at any point in combat. Other than this will press either the left or right touch pad in the middle to jump or re-spawn and that is all you need. Now, one issue I came across playing the game on Windows Mixed Reality compared to Oculus Rift and the HTC Vive is the tracking was lost a few times. But, this is down the inside out tracking that the hardware uses to track controllers and not the game. This did lead to some unintended and accidental deaths, but it’s not game breaking just frustrating at times. One thing that Psytec Games have always done is offer plenty of comfort options in their games, to make them accessible to anyone, and not nerfing the experience for veterans. 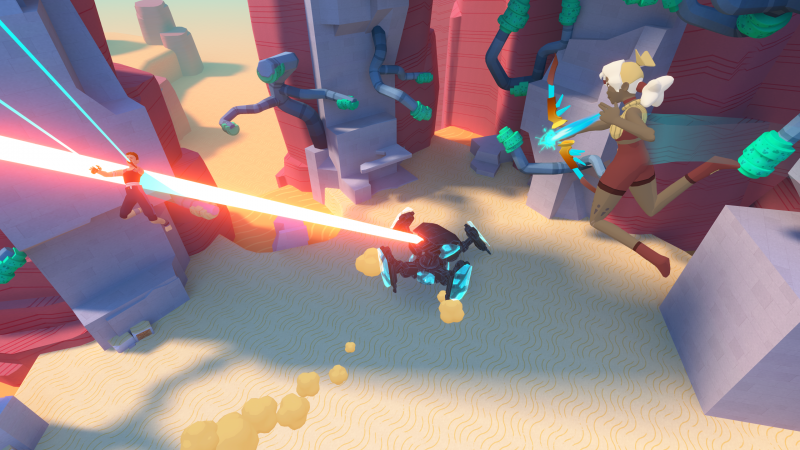 I am glad to say they have continued this trend in Windlands 2, even though the movement is so fluid and quick, they have made sure it is as comfortable as possible for those with not so good VR legs. The campaign mode lasted me around six to seven hours, and that was just going from objective to objective, without really exploring all the universe. Which for is not bad time for a campaign mode when it comes to VR titles. But, there is so much more included to keep you coming back for more and to revisit the Windlands, other than playing the story mode again. In each of the three areas in the game you can find 20 hidden plates to collect, like the ones hidden in first instalment. The speed mode has returned and you try to set better and better times for yourself or friends to beat. Or maybe you want to challenge yourself with modes like No Hooks, so it’s all about that parkour platforming, or one life mode… or just look for Easter eggs hidden through the game. There really is a huge number of reasons to keep returning to the game, and the best thing is… it is not without reward. You will given new Hooks for all of your troubles!. 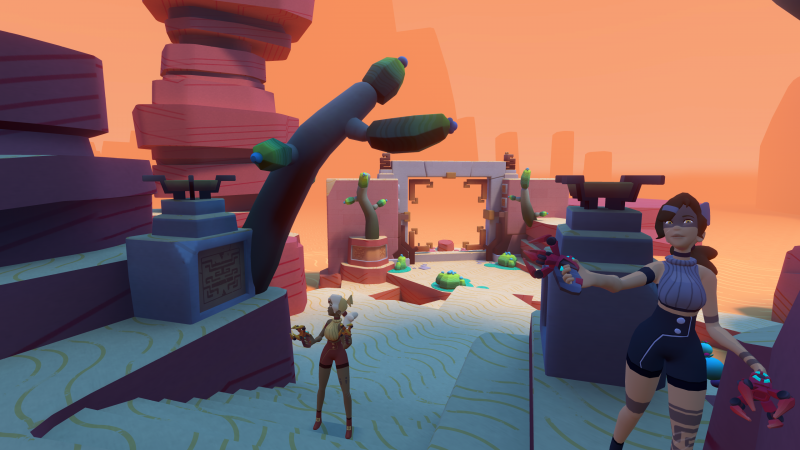 Windlands 2 has taken the excellent movement system and challenges from the first and just added more and more to it. The inclusion of combat, intense boss battles, and a fully fledged campaign mode which can be played in co-op… the game has taken all the steps in the right direction. I really would recommend trying the game out in co-op even if it’s not usually your thing, because it really does excel in this title. With a campaign that will last around six to seven hours and many reasons to return, you will find really difficult to not be soaring through the universe on a frequent basis. All I can really say is do yourself a favour and grab this title, and take in the true desire and love the team at Psytec Games have put into the game, which is easy to see in every aspect of what you are experiencing.